You are desperately NEEDED! Wake Up! "Life on Earth is out of balance, so out of balance that today the entire planet is missing its Mother. 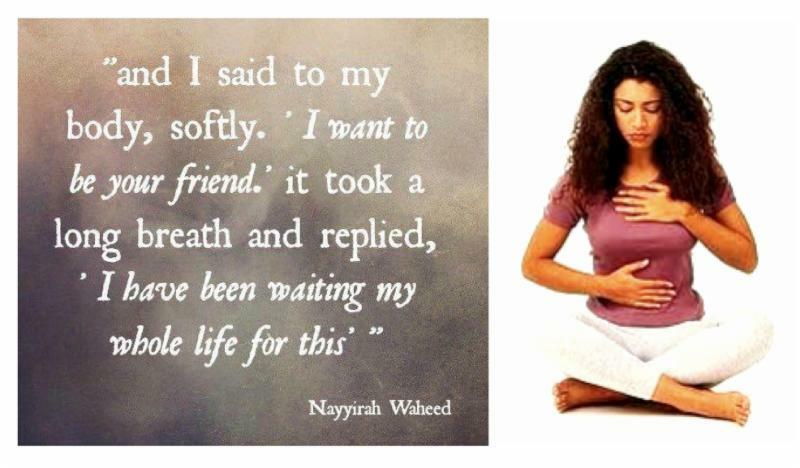 All of you feel the lack of the Feminine Principle(Yin) , the holder and nurturer of life. Without its Mother, humanity is suffering and lost. For eons you have been forced to live without a Mother. To rely solely on the Masculine Principle(Yang) for everything. It doesn't work that way. The energy of Yang cannot by itself supply all that humanity needs. However, you've had no choice. You had to turn to the Masculine Principle for everything because the Feminine Principle was no longer present. It's been absent from the earth for so long, that people living today have little or no understanding of the beauty and power of Yin. "Your country has been swept by a dark tide of lies and corruption. The run-away energy of Yang has become so dominant that it's destroying all you've held dear. Not just your country, but everything in your world is out of harmony, and will continue in a downward spiral until and unless you wake up, step up, and claim the long-absent power of the Feminine Principle. We, the Great Council of the Grandmothers, have come to earth at this time to return the Feminine Divine. the mass-mind consciousness of your time whispers, but NOW ! Please wake up. 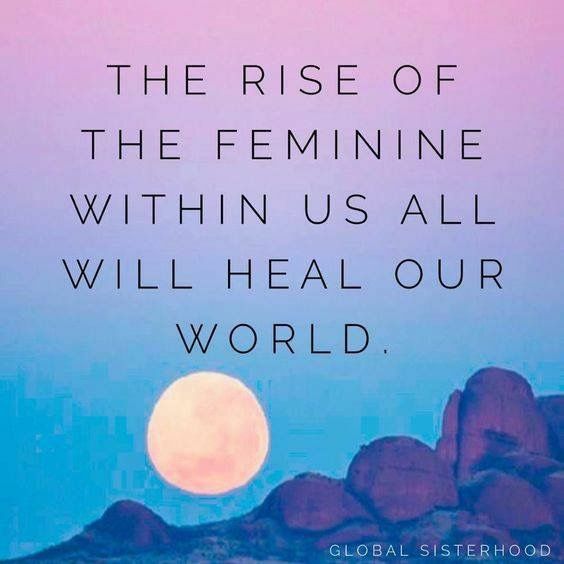 Commit to restoring the Feminine Principle to the earth. Call on the fire within you. Call up the power of Shakti until you feel it. It's REAL. This power serves live; it is a blessing for the earth. It's time to return to balance, and we remind you that for this, women must lead." from Sharon McErlane book "Casting the Net"
If the message above speaks to your heart and moves you, please get the "Grandmothers books" written by Sharon McErlane, read their lessons, receive the Empowerment and take this opportunity to serve. You are NEEDED! Transendance - Center for Inspired Change is celebrating its 9th anniversary and hosting a 3day Open House! November 10, 11 and 12 from 10am-5pm. All Sarasota locals and visitors are invited to join, share the fun and help raise the funds for hurricane victims in Puerto Rico. Dr. Tatiana Agafonova, D.C. , the founder of Transendance, will showcase the Re-organizational Healing(ROH) techniques ( Network Care & SRI ) that have helped already thousands of people to restore their Health and reorganize their Life. 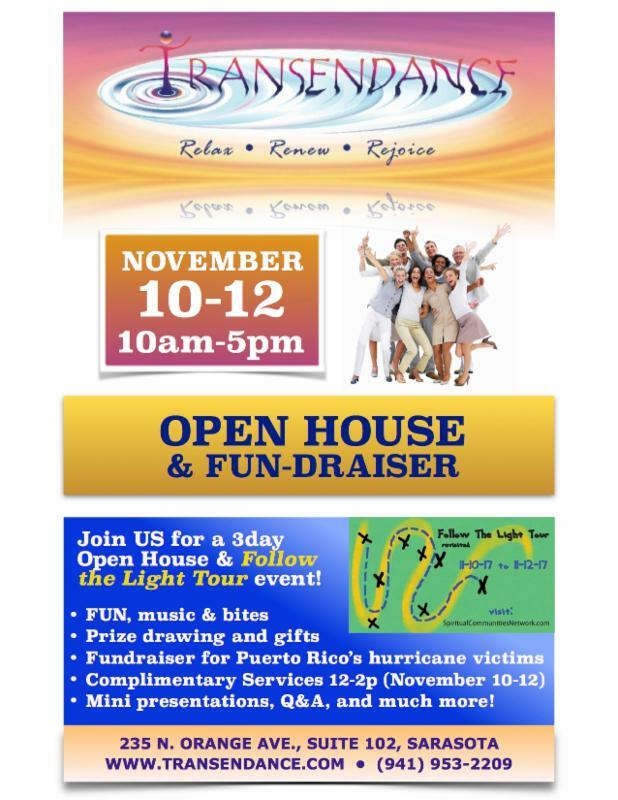 Donations based Network Care adjustments/entrainments will be offered to public during the 3 day Open house between hours of 12pm-2pm , and ALL donations raised will go to a former staff member's family who was affected by hurricane Maria in Puerto Rico. and be sure to catch the drawing for free services, gift cards and more! Bring you Families and Friends! ﻿Healing is "being with IT" or Experiencing. 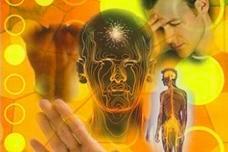 Each stage has a unique rhythm and consciousness, and when fully experienced with help of S.R.I. Exercises, provides us with opportunities to integrate parts of ourselves that's been ignored, disliked, traumatized or not forgiven. It helps us to integrate all the apparently separated parts into a whole. Somato-Respiratory Integration(SRI) Exercises are the means through which we experiencing each stage/rhythm our body-mind through focused attention, touch, breathe and movement. When Harvard brain scientist Jill Bolte Taylor suffered a stroke in 1996, she lost her language, memories and ability to think about the future. What she gained was an entirely new perspective on life. Watch as she shares the lesson that changed Oprah's life: You are responsible for the energy you bring into a space. Even though you might know the story of Jill Bolte Taylor, his particular video highlights a very deep truth, and all of us can benefit from it by becoming more aware of what we do with our energy! Professor Randy Pausch , a devoted husband and father who was fighting pancreatic cancer, shares in his famous last lecture about how facing his mortality taught him to live every moment like it's you last! "..When you lead your life the right way.. the dreams will come yo you." and we are so grateful for your support and your interest in our "goods and deeds"!